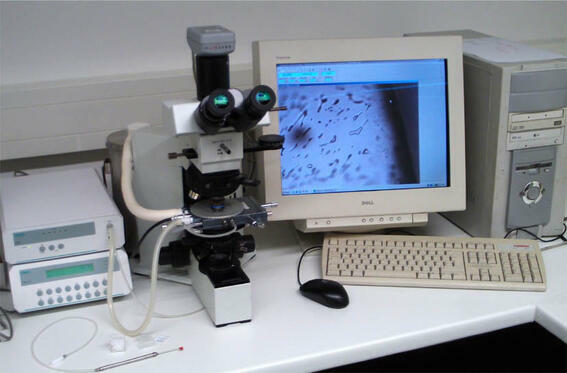 LINKAM THMS600 heating-freezing stage, applicable in the range from -196° to 600°C, mounted to a OLYMPUS BX41 microscope, equipped with a special lid, 40x objective and condenser lens. The stage is computer controlled by the Linksys 32-DV temperature control and data acquisition software with digital video capture and a Pixelink CCD camera with high resolution 1.3 megapixel array. Synthetic fluid inclusions are used to calibrate the stage, resulting in measurement accuracies within +/- 0.2 degrees at temperatures below 100 C, and +/- 0.4 degrees at higher temperatures.